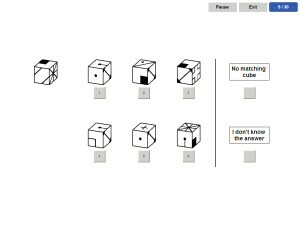 This test compiles a setup in which three faces of a reference cube are in view. The faces show symbols instead of dice numbers. Right of reference cube there are six other dices displayed among which you are to identify the one that matches the reference dice viewed from another perspective.